As part of the TURN8 mission to encourage regional entrepreneurship, we routinely explore potential locations in the Middle East where the start-ups can get maximum benefit. We recently selected six TURN8 start-ups that best suit the Saudi Arabian market and conducted a Private Investor Demo Day for Saudi angel investors during the ArabNet Riyadh 2014 show. The Saudi Demo Day was highly successful, with several teams receiving potential investment opportunity and four term sheets from investors, which is the first step toward an investment in the start-up. With nearly 30 angel investors attending this private event, and the interest level shown by the investors in the technology-based start-ups that are ready for investment, such private events would help shift investments from real estate businesses to investing in start-ups. TURN8 would like to make this an annual affair by bringing in more start-ups to Riyadh and attracting additional investors. TURN8 also looks at being there at the investor location as a shift from the norm where accelerators invite investors for demo day to their base location. A private demo day model is something that the TURN8 team is working on to help facilitate the startup-investor relationship. Interested in a private demo day at your location? Contact TURN8 to discuss the possibility. 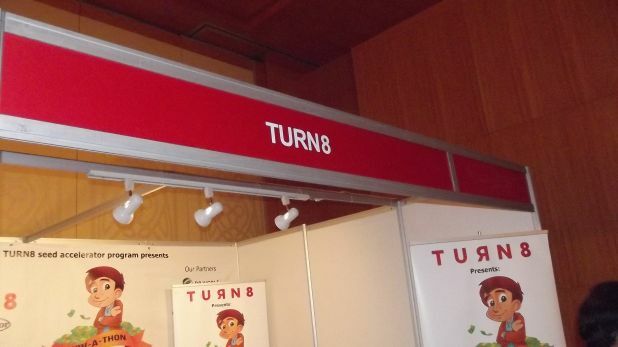 Additionally, TURN8 will hold an Investor Demo Day in Dubai for graduates of Round 3 (Fall 2014). For details and to reserve a place, visit http://www.turn8.co/demo-day/. On May 16, the TURN8 team traveled to Cairo, Egypt for another Innov-a-thon Startup Idea Pitching event. The selection panel and young, friendly crowd of nearly 50 people listened attentively as 14 ideas were presented by those hoping to earn a spot in the TURN8 seed accelerator in Dubai. After the initial idea pitches, attendees worked to refine their ideas and business model, with the help of a few regional mentors and coaches in attendance. After the final pitches at the end of the day, five teams were pre-qualified for the TURN8 seed accelerator, and will be further interviewed by the selection panel. The Cairo event was held at the AlMaqarr coworking space, with the generous assistance of the AlMaqarr team! The next TURN8 Innov-a-thon will be held on June 14 in Ankara, Turkey as part of Android Developer Days. The team will also visit Minsk, Belarus and San Francisco, CA (USA) this month. Find more photos from the event on the TURN8 Facebook page! The TURN8 team is pleased to be at the Global App Summit in Dubai, June 4-5. We’ll be looking for entrepreneurs, startup teams and creative geniuses who want to take their ideas to market, so stop by and see us in booth #8! On June 5, at 1 p.m., TURN8 is hosting a short idea pitching session in the App Lounge. You can sign up at our booth. Also on June 5, Kamal Hassan, TURN8 director and founder/president of Innovation 360, will be speaking about “Mobile Innovations for SME Sector.” His talk begins at 11:30 a.m. in the summit conference room. Ready to pitch your idea? Join us at an upcoming Innov-a-thon event. Or, pitch your idea online…sure, it’s not as fun, but you still have a chance to be selected for the TURN8 seed accelerator in Dubai — a fun, inspirational, life-changing event! Need more inspiration? Check out our other videos! TURN8: DP World Initiative – Yousif Al Mutawa, DP World CIO and TURN8 Director, explains the idea behind TURN8. Bringing TURN8 to the World – Kamal Hassan, Innovation 360 founder/president and TURN8 Director, explains the idea pitching events and the quality of ideas being presented. Interview: Dr. Bruce Ferguson – Dr. Bruce Ferguson, Masdar Professor and TURN8 Advisor, discusses the importance of finding innovative ideas and providing support to early stage entrepreneurs. The first TURN8 Innov-a-thon idea pitching event was held on Saturday, May 11 at DP World’s own trendy Head Office Cafe in Dubai. Seventeen teams pitched their entrepreneurial ideas to an esteemed jury panel during the all-day event which sought to discover innovative technology and startup ideas for the TURN8 seed accelerator. See more photos from the Dubai Innov-a-thon on our Facebook page! Prior to hearing the idea pitches, the crowd heard from Prof. Bruce Ferguson, Professor of Practice , Engineering Systems & Management at Masdar, and Kamal Hassan, founder of Innovation 360, the organizer of TURN8 events and whose i360accelerator is the model for the TURN8 seed accelerator. Both are on the TURN8 selection committee. To kick off the pitching, all entrants – including a vivacious 15-year-old entrepreneur pitching an idea for a “Teeny Weeny” social platform – gave a one-minute elevator pitch. Following this, the participants worked in teams and received mentoring to help them prepare for a final five-minute pitch. The jury deliberated for some time before announcing the top five ideas of the day, including a content-based indoor navigation application, a P2P rental marketplace, an integrated supply chain management solution for SMEs, an education to vocational portal, and a dining experience application. These teams are now pre-qualified for the TURN8 seed accelerator. Final selection for the accelerator will be made at the end of the scouting phase, which includes several more Innov-a-thons and ideas submitted online. The panel named an additional five teams and invited them to return and re-pitch their ideas at the next local Innov-a-thon. The i360accelerator team gratuitously extended some professional guidance and mentorship to the runner-ups. The jury panel included Mr. Hassan and Prof. Ferguson, as well as Alexander Williams, Director of Strategy for Dubai SME, HH Sheikh Mohammed Bin Rashid Establishment for Young Business Leaders; Afzal Khalfay, Vice President of IT, DP World Head Office; Yousif Al Mutawa, CIO DP World Head Office; and Ranjith Powell, Manager of Research and Development, DP World Head Office. The next Innov-a-thon is scheduled for May 16 in Cairo (register here), with events in Asia, CIS, Europe and the U.S.A. planned to follow (see the full list of Innov-a-thon events here). In addition, anyone with an idea for TURN8 can pitch online here. Anyone can go to the same link to vote for the best ideas submitted online. DP World today announced the launch of TURN8 seed accelerator program designed to encourage innovative entrepreneurship worldwide, starting with Dubai. TURN8 will look for people with ingenious ideas that can be refined and brought to market through a “seed accelerator,” a program that selects start-up teams with marketable ideas and supports them with funding, mentoring and training in exchange for a stake in any resulting business. The TURN8 program will take place over the next 12 months, beginning by seeking innovative ideas through an online campaign, and events in select countries with active start-up cultures, including the UAE, Egypt, Jordan, Singapore, Malaysia, the Ukraine, and USA. The program is powered by Innovation 360, a leading UAE innovation management consultancy, which has already established its own seed accelerator (i360accelerator), bringing several innovation and entrepreneurial initiatives to the region. Proposed ideas can be in a variety of sectors including travel, trade, supply chain management, shipping, transport and logistics, logistics security, safety, sustainability and the environment. Those with winning proposals will be invited to the TURN8 seed accelerator in Dubai, where they will be provided with workspace and professional mentoring for four months to develop their business model and prototype. Up to USD 24,000 funding per team is available to help them evolve their ideas from conception to commercialisation.